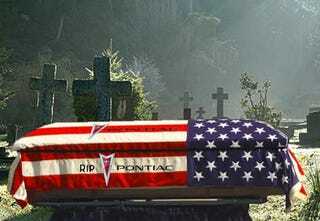 Pontiac was officially declared dead this weekend at 84 from complications due to GM ownership. In honor of this sad occasion, we're re-running our Pontiac eulogy from 2009. — Ed. . Welcome, friends. We're here today to bid farewell to GM's Pontiac. Once a re-badged middle ground between Chevy and Buick, it attempted to build excitement. Now, it is gone in a blaze of platform prostitution. Pontiac started life as part of the General's mid-20s "companion" program, which the once-massive automaker implemented to create a sensible cost difference between their cars. Pontiac models were to be produced by then Oakland Motor Car Company, a quality six-cylinder line of cars, and designed to be placed between Chevrolet and Buick. Pontiac cars sold well but, when the market crashed, the companion program was discontinued, Oakland was folded and GM severely cut back on their offerings. What helped Pontiac survive, beyond its popularity, was the cheap production cost attained by combining components with Chevrolet. When GM was forced to reduce itself to three divisions, Pontiac was rolled into Buick and Oldsmobile with dealers forced to sell all three if they were going to sell one. This would save the brands but set a precedent partially to blame for their inevitable downfalls. As a brand, Pontiac followed the movement of the market in design and offerings, eventually moving up to eight-cylinder engines including the 249 cubic-inch straight-eight, which served in Pontiacs until the mid 1950s. During this whole time what Pontiac always managed to keep was its sporty design, including the classic "speed streaks" along the fenders and other sharp metallic trim. Still, until the 1960s Pontiac remained an also-ran company. Pontiac's fortunes quickly changed under the management of Bunkie Knudsen and car enthusiasts-turned executives Pete Estes and John DeLorean. Knudsen had the vision to see Pontiac as something other than merely slightly nicer Chevrolets and the idea to bring young blood like Estes and DeLorean into the fold. This plan started out rather simply, with the introduction of a convertible based on the Pontiac Star Chief in 1957. The most expensive Pontiac to date, the car had a bored-out and powerful V8 and sharp looks. Though heavy and somewhat slow, the few cars produced were placed in dealerships and raised awareness of the brand's sporting nature. What would really turn on buyers came seven years later with the introduction of the Pontiac GTO. The story, as repeated numerous times, goes like this: when GM put a ban on divisions participating in auto racing, Pontiac felt its newly cultivated image as a performance brand would be ruined. In order to win fans among gearheads DeLorean, along with a few others, decided to offer a Pontiac Tempest with a 389 cubic-inch V8 as an "option" package hoping there would be a market for a racer's engine in a teacher's car. The name came from DeLorean's appreaciate of the Ferrari acronym for a homolgated race car. It was a gutsy move but one that paid off huge. The rest of the 60s included a consolidation of the brand's concept, though they continued to sell vehicles with less power and less performance. In 1968, the Pontiac Firebird would give the brand a Camaro-based pony car and in 1971 the Pontiac Firebird Trans Am would set the name for a long history of performance cars. And then the 1970s happened. High on success, Pontiac attempted to show up Chevy in the 1970s by doing more, which meant more production and more competitive pricing. Unfortunately, this movement of Pontiac models all around confused buyers and the company's sales sagged. The rapid increase in gas prices and the Malaise Era didn't help either. Pontiac didn't have a small car and had to readapt the Chevy Nova into a Ventura. The performance brand would soon become more and more the other Chevy, though not especially luxurious or perceptibly sportier. With the exception of the Firebird Trans Am, there wasn't much to be excited about. The 1980s would prove equally uninteresting with two exceptions: the continued production of the Firebird and the Pontiac Fiero. The Fiero was innovative — as far as 'merican cars were concerned. It had been decades since an American automaker built a two-seater, mass production car other than Corvette. It was also the first mid-engine production car to come out of Detroit. But innovation can't be rushed, and what was actually produced was cool to look at but miserable and uncomfortable to drive. By 1988 the car was sorted out, but it wouldn't matter. It was already dead. The exciting promise of the Fiero, though never fully fulfilled, did inspire Pontiac in the 1990s to at least mimic what they once were. The new Firebird, though funky, had its appeal among American muscle car fans. The redesigned Pontiac Grand Am added athletic flair to boring GM platforms, helping the brand to become a sales success again. Even the Bonneville, which had sunk to unsexy lows, got a new rounder treatment with cat's-eye headlights and almost a Hoffmeister Kink at the rear. The addition of the SSEi supercharged model almost created a true competitor to foreign makes. Unfortunately, by the late 1990s any sense of a performance-orineted brand faded away. The new lines of the early 90s were bloated into the ugly body-cladding we all learned to hate. Rather than offering sportier Chevys, the brand started offering uglier Chevys. By the mid-2000s this turned into perhaps the ugliest Pontiac of the modern era: the fifth-generation Pontiac GT, which was a misshaped, FWD, underpowered, ugly coupe with as much cladding as you could possibly imagine and had one of the worst car interiors ever. The one bright spot for Pontiac in the first half of the 2000s was the Holden Monaro-based Pontiac GTO, which was a good idea poorly executed — seeing a pattern here? America wanted a RWD, V8-powered sporty monster as proven by the recent move towards vehicles like the new Camaro, Mustang and Challenger. Sadly, rather than remaking a new car here in America to satiate this desire they merely imported Australian-built cars and slapped a new grille on them. They were a flop, but once again hinted at what would come. If we're generous, the GTO was a place holder for what GM hoped to rebuild the brand into — the definition of performance. The Pontiac Solstice, though not an amazing performer and a shared-platform ride, was consistent with the brand's image. Even better was the introduction of the Pontiac G8, which brought the promise of an impressively performing RWD American sedan. In G8 GT and G8 GXP trims it's a world-class car. Then, last year, they announced the Pontiac G8 ST sport truck and we were on cloud nine. Pontiac seemed ready to move away from the boring, Chevy-derived products like the G5 and G6. We could sense a new future. We really were going to be driving excitement. And then the Carpocalypse happened. Pontiac announced it would be killing the Pontiac G8 ST and bringing a rebadged Aveo to the market as a Pontiac G3. Also, word came down GM was killing the Pontiac G8 altogether. Unlike the transition from the 1960s to the 1970s, Pontiac's death spiral appears it will occur almost immediately after its first steps in the right direction. We're hearing the Pontiac nameplate will live on but not as a separate brand and on what products and in what form we we don't yet know. Is the General right to kill the brand now? Would Americans truly embrace great, RWD American cars once again? Are we better off getting less? There's no way to be for sure, but in our minds GM is killing the brand as soon as it was starting to again build a reputation and a following. This article originally appeared on February 18, 2009.